Ever wanted to see a silent film, with live organ accompaniment? 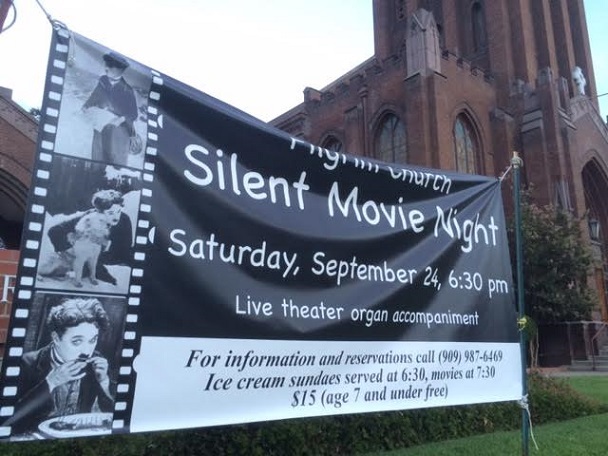 Here’s your chance: A church in Pomona will screen two comedies Saturday night and use the pipe organ to provide music. Sounds like a fun event. That leads off Wednesday’s column, followed by a Literary Corner, a Culture Corner and a Valley Vignette. Note that I’ll be selling and signing “Pomona A to Z” at two places Saturday if you’d like a copy; details are within the column. 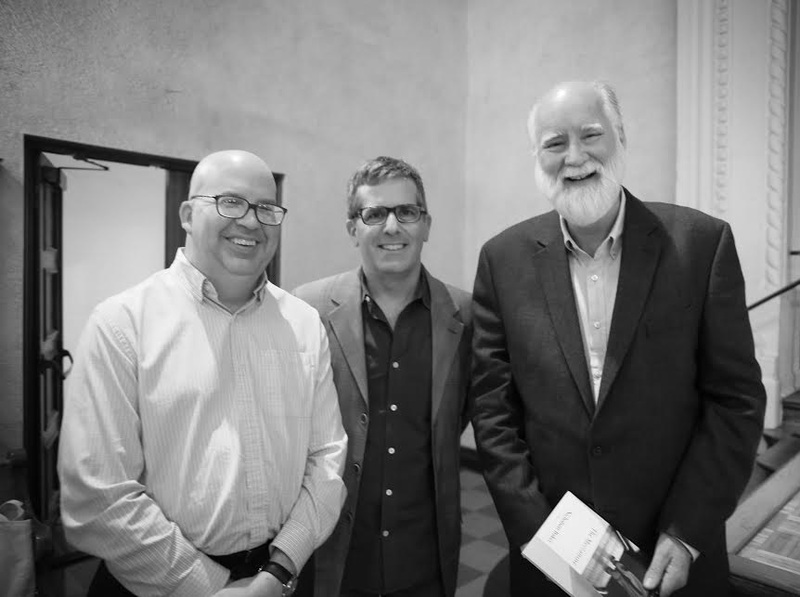 Acclaimed writers Jonathan Lethem, center, and Nicholson Baker are photographed after Wednesday’s conversation at Scripps College. The man at left has not been identified. Photo by Jackie Legazcue of Scripps. 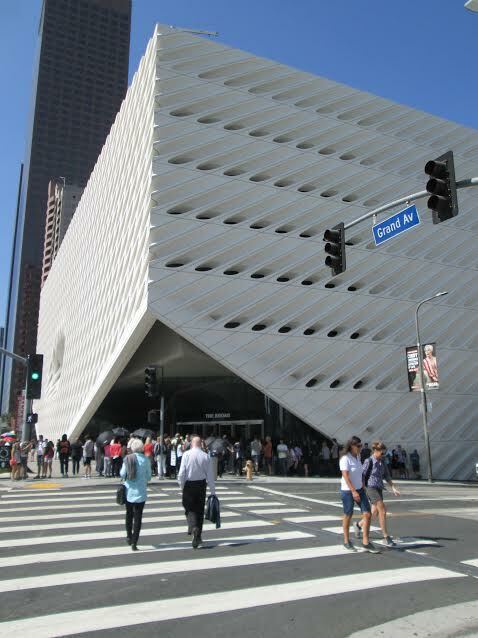 For Sunday’s column, I rode the Silver Streak bus from Montclair to downtown LA’s Broad Museum on Bunker Hill with a couple of public transit pals. It’s kind of a dual review of the bus and the museum. At $4.90 for me for the bus, and the free admission, it was low-cost, although the lunch spot more than evened things out. Photo above of the Broad by Grace Moremen. That’s Jacqueline Chase and me in the crosswalk. Author Nicholson Baker had his own ideas of how education ought to be fixed, but he realized he was an impostor because he was coming at it from a theoretical angle. So he signed up as a substitute teacher. Promoting his book “Substitute,” he spoke in Claremont, a talk that leads off my Friday column. After that, I update my recent column on Ontario’s Meredith Property and add two short items. The poke craze, like the Pokemon craze, has hit Claremont. 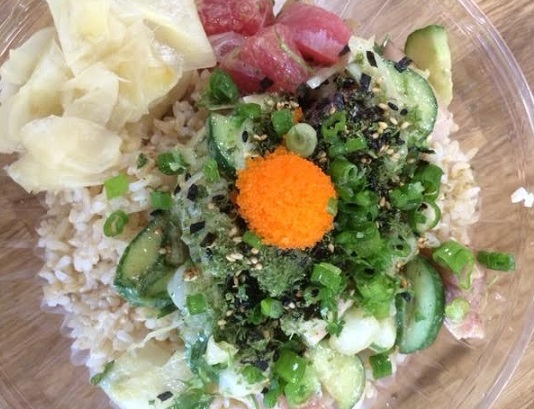 Poke Dot, whose only other location right now is in Irvine, opened last week in the Village (or the “new Village,” depending on your outlook). A “coming soon” sign for Oke Poke is hanging outside the Old School House. A friend alerted me that Poke Dot had a half-off deal for its opening weekend, so rather than let the place settle in, I headed over on Sunday. It was busy, not surprisingly. The restaurant, whose name is a pun on “polka dot” if you need help with the pronunciation, is between Jamba Juice and a skate shop and replaces a gift shop that moved a couple of doors north. 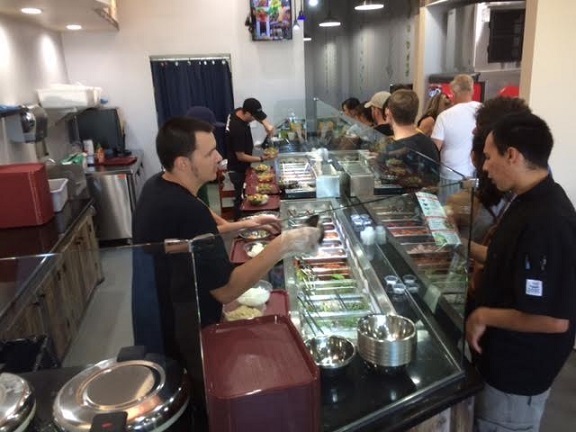 As with Oke Poke, whose Chino Hills location was featured here recently, you line up like at Chipotle or Subway to make a series of possibly bewildering choices. Regular or large bowl, OK. Salad or rice, yes. By the time you decide whether you want masago or furikake, or both, you may be flying blind. I opted for a regular bowl ($9), brown rice, a mix of cucumber, onion and cilantro, then tuna, scallops and the seasonal fish, yellowtail. The seasoning and sauce question was answered cilantro twist, and for toppings, I got masago, furikake and green onions. Combined with a canned soda, I’d normally have paid $11. The bowl was quite good, and while I had liked Oke Poke, the fish seemed to be of higher quality here. Which is good for me, since Poke Dot is closer than Chino Hills, or even the Old School House. 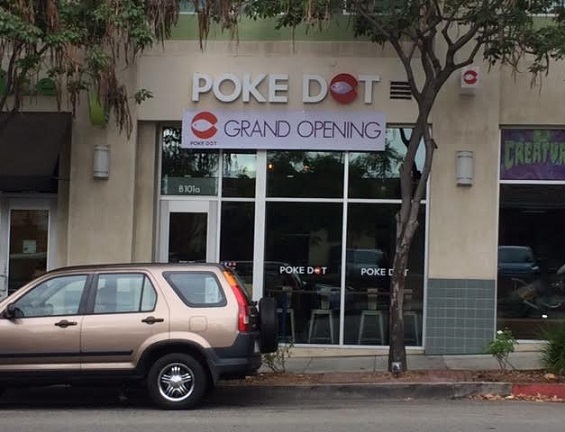 At this point, the only other Poke Dot is in Irvine. After your meal, you can play Pokemon in the neighborhood — the fountain in the courtyard plaza is a hotspot, as is 2nd Street between Harvard and Yale. I was in Portland, Oregon for four days last week. 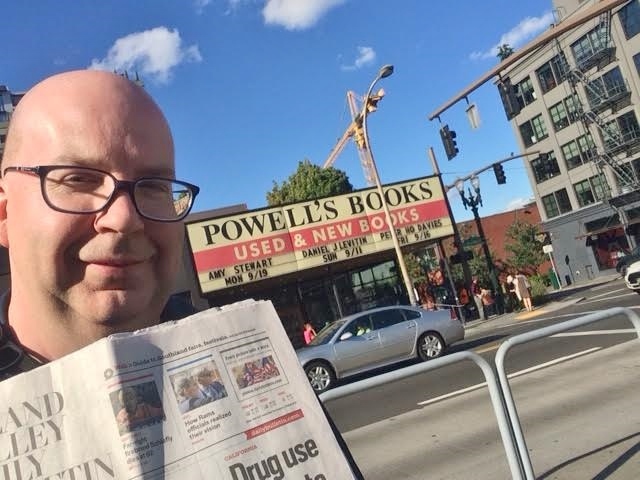 It’s tough taking a selfie while also getting a newspaper into the frame, but this was the best I could do outside Powell’s, the famed bookstore. It will be the subject of Wednesday’s column. In the Why Am I So Good to You category, please note that your humble servant managed to write three columns before leaving, while also giving up moments of vacation to post them here and elsewhere on schedule. Besides saving you the pain of deprivation, the extra work helped me clear away some material. Everyone’s a winner. 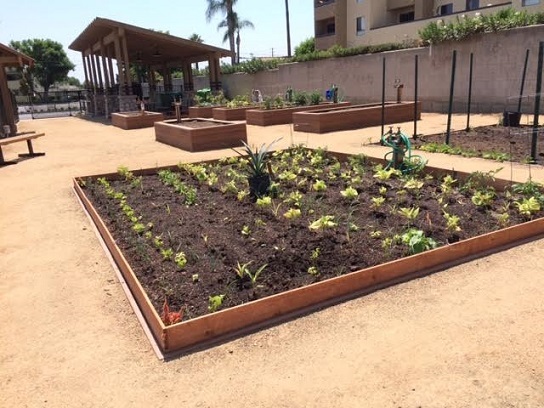 Sunday’s column presents seven items from Chino, starting with the recent opening of a community garden and pocket park. After that comes five Culture Corner notes and a Valley Vignette. 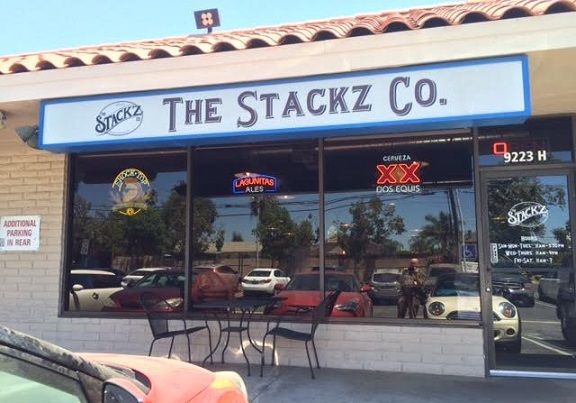 Restaurant of the Week: The Stackz Co.
I’ve passed by Stackz, which wasn’t far from our old office, but never pulled over. The aging business center is uninspiring, and then there’s the Z in the name and on the second sign, “Subz, Saladz and Brewz,” which subtly offended me. Then we moved our office over to Archibald, where we’re now 3/10ths of a mile from Stackz. A couple of newsroom colleagues reported how good it was, as did a random reader. So I dropped my prejudices and went in. Stackz has beer and wine cocktails, and also sandwiches and salads. The interior is industrial chic, with plank walls, exposed ductwork, corrugated metal trim, a barrel and some interesting art, all vintage B&W photos of early airplanes and bicycles, I think to match the old-timey design of the logo. 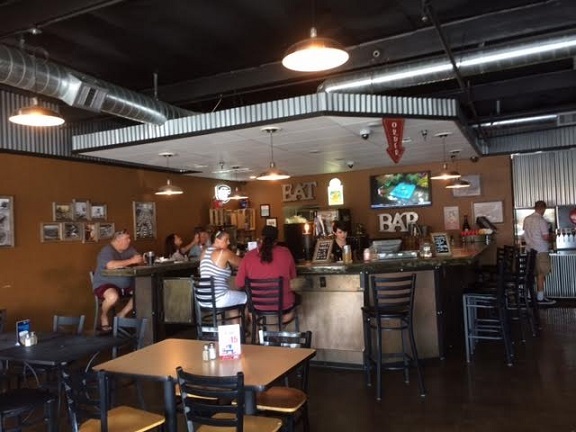 You order at the bar and take a seat at a table, a picnic table or the bar. 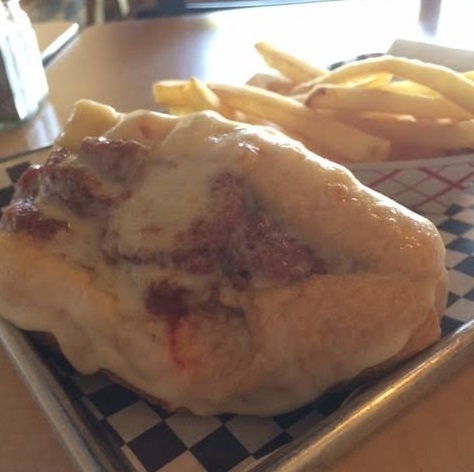 On my first visit, I got the meatball sandwich ($8) as a combo with fries and drink ($3 more). This sandwich was very good, especially the springy roll, which tasted fresh. It was a pleasant surprise. No wonder people say nice things about Stackz. 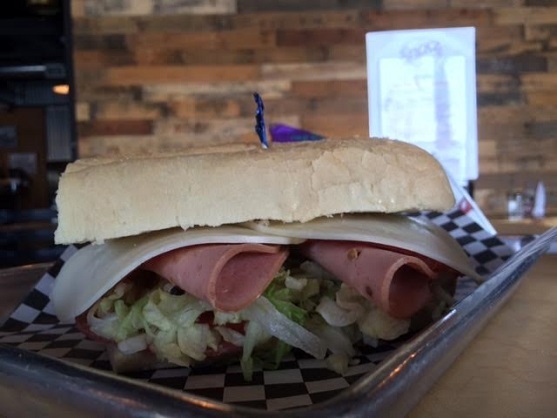 I went back another day and got the cold Italian sub as a combo with chips and drink (same price as above). While I’m not generally a fan of cold sandwiches, this was pretty good too. The atmosphere is somewhat male. The majority of customers are men, and on my first visit, a picnic table of them silently eyeballed the female server as she walked away. That said, the service is friendly, there are women customers and the menu even has kids items. Also, the sandwiches are quite good. I’d go back even if I had to drive a few miles. In Wednesday’s column, a second downtown Pomona antiques store closes after its building is sold. 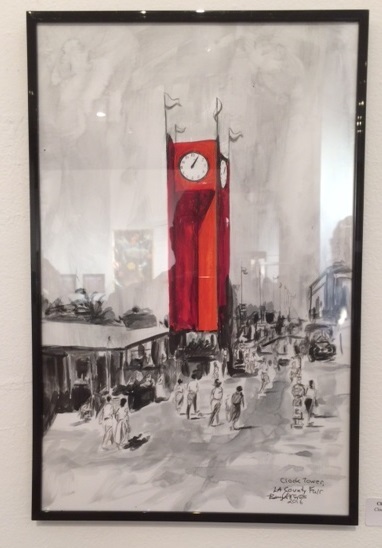 Olde Towne Pomona Antique Mall was in business 26 years. Also: Ontario’s Fiestas Patrias event Sunday is expected to draw 12,000 to downtown, and a bailout for Farrell’s Ice Cream is my Valley Vignette.